I’m not normally the type of athlete that will compete in the same races each year, I like to keep things fresh. 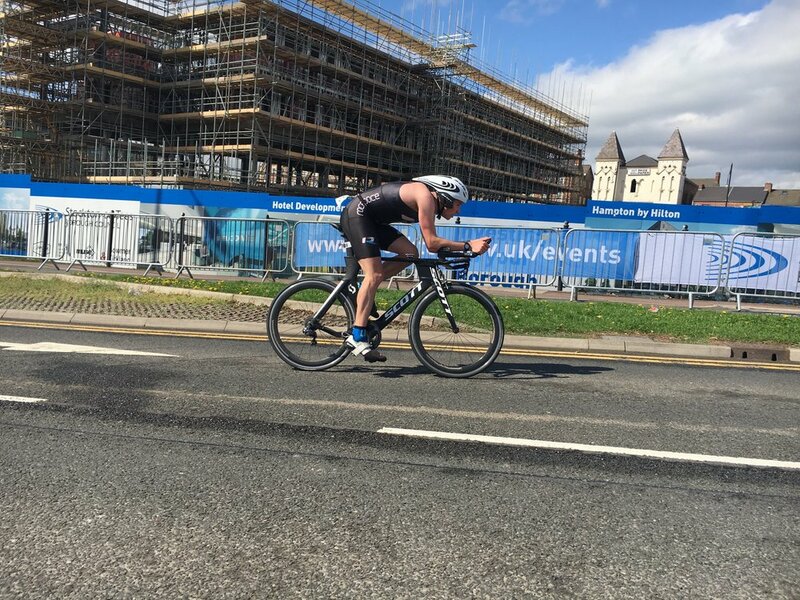 However that being said, Sunday was the third time I has raced at Stockton Duathlon. In 2016 I raced the sprint distance and last year the standard. This year I would return to race the standard distance and look to improve on last years performance. Race day in Stockton is a busy one with several races throughout the day, first up was the sprint distance and a chance to watch teammate Samantha have a really great race finishing third woman. 1pm saw the start of the Standard distance and I was lined up with teammates Beau and Robert. My aim for the race was to attack it from the start and in doing this comes some risks. The first run was relatively uneventful although on reflection I may have gone slightly too hard on the first of the two laps. Out onto the bike and with several dead-turns and roundabouts to contend with you have to be on top of your game to ride quickly and smoothly on the course. I was half way round the first lap and unfortunately misjudged my speed and the severity of the second roundabout and before I knew it I was sliding across the tarmac. Luckily avoiding any other competitors I was soon back on my feet and trying to ride away. It soon became clear that my bike had taken a bit of damage during the crash but after a bit of work I was able to get back out all be it with gearing that wasn’t quite right. I was able to complete the 5 remaining laps on the bike remaining calm and focussed on riding smooth. After T2 I was out on the final 5k run loop. I was unsure at the time what damage I had done to myself during the crash but felt like I was running well and really focussed on keeping good form all the way to the line. Checking the results I had finished 8th female and had a few extra bits of gravel rash and looking at my bike it appeared I was lucky to finish, a couple more inches and the rear mech would have been in the rear wheel and I would have had my first DNF. 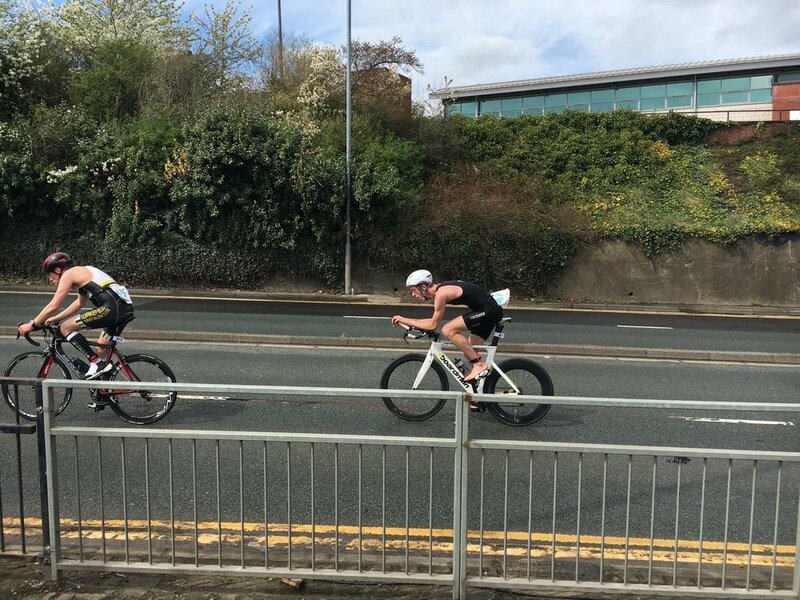 Second Race of the Season 22- 4- 2018 Stockton Duathlon. Urggh not a fan of the duathlon as my running is me weakest bit. But doing things you’re not good at is a good challenge. Or so I tell myself. The day before is a hot day so I up my fluids to endure I don’t dehydrate. I have the kids with me and we are staying the night before, so we are packed checking things twice. Sarah and I do a bike recce that evening and the course is not as bad or as tight as I had in mind but the roads are very quiet and I am aware once you get a few bikes out there things could look very different. The course is all closed roads. Race morning I rack my bike, leaving the kids with Pete and Sarah I head off to race briefing. All I can hear is people talking about the course and how chaotic it can be and I think of Liverpool…Carnage, I start to wobble, I am not great with my bike confidence after my crash when others are around especially those unpredictable riders. I stand and gather my thoughts, give myself a pep talk which consists of get over it and we walk to the start line. I don’t stand on the front line because my running is way off those runners but to make sure I’m in the race I am in line with the other lady’s in the race. We are about 3rd row. Gun goes. Everyone piles past. Go ahead….it’s a slight incline so I take it easy and once up start to pick up the pace but I remain controlled its over 5K and I have a bike to do after so we are not going for a park run PB here we are doing a duathlon keep it on but not over and I listen very carefully to my body, something I am getting better at thanks to Rodger. It started to rain, this was welcome because although it was not sunny it was hot. We are heading to the transition over the final bridge I had been told it was wobbly but in my warm up it wasn’t. However add another 20 people and it’s suddenly very wobbly. I concentrate very hard on holding it together and getting over it. Into transition, out of transition, run past everyone on the mount line into clear space and a much better scoot mount booth feet straight in Boom, off we go. At this point I was 15th lady and minutes behind the others but I didn’t know this at the time. It was raining and the corners were slippy at times and so everyone was being sensible and the first lap was uneventful with me feeling very strong and going past a few lady’s. On the second lap I consciously took a drink, something I am working on, but I lost time as I did not do it smoothly, next lap I nailed it though. Second lap was busy with traffic but I was still remaining trouble free and going strong, I was using my gears and 100% concentrating on what was coming and what I was doing. The last lap was very busy and I began to get caught up in traffic I was told I was now Third lady which I couldn’t believe as I knew many had gone past on the run. No time to think of that just keep going. I became assertive shouting on your right a few times and moving smoothing and quickly though the traffic, I faltered on one round about as it was very busy but they were really holding me up so I gave a big shout, on your right, and they all moved over…. I felt bad but I’m racing and racing hard so needs must…. End of lap, I do hope I haven’t gone too hard, in reality I know I haven’t. Through transition and off onto run, only 2.5 k to go right. Hard lets do it…. First marshal tells me I’m second lady.. Idiot no I’m third. Next marshal says the same thing…. Oh wait I must have got her in transition. Boom. The man running next to me says “second lady amazing!”. But she’s just behind me and I am going as fast as I can without going into the red. She passes me and we go up two lots of steps and she pulls away but once I’m on the flat again I’m catching, come one… over the wobbly bridge again not so bad this time as less people and she pulls away again but on the home straight I am catching her again but not enough. I wish I had more, Could I have gone harder? Was I actually capable of more? Not on the day. But this is my aim for the future. Ended Third Lady with a time of 1:07:37 and the fastest female bike time. Extremely happy with that, given the rain, my not so great skills and my wobble at the start! I was looking to execute a good race here and improve on my performance at the same event in 2017. I arrived at the event in good time and was able to support Samantha who was competing in the Sprint distance race before getting my transition kit set up and warming up. The race set off quite fast with some strong runners in the field but I knew that I needed to pace my own race if I was going to get the most out of my body. I completed the initial 10km run in 6th place and was soon out on the bike. I aimed to ride the first lap just below the intensity I'd hope to hold for the rest of the 40km bike section, in order to give my legs time to get going but even so I was soon up into 4th place and before the end of the first lap I was in 3rd and feeling good. I rode as smoothly as I could and avoided surging my power up, even with the technical course which can disrupt your pacing and rhythm. With it being such a popular event there were lots of other athletes on the six lap bike course, so keeping awareness was important. I eventually moved up into second place in the second half of the bike leg, and gained a bit of a gap. When I arrived back into T2 I was comfortably in 2nd position but well behind the leader - I'd just aim to run my fastest possible 5km off the bike. For the first part of the run I just focussed on getting a nice fast cadence to get my legs turning over and before long I was flowing along nicely. With no sign of the athlete ahead or behind me I just ran my absolute hardest to the line finishing quickly and with nothing left in the tank. I was really happy to wind up in second place and to have improved both my run splits compared to last year's event.